A new bill introduced in Congress this month would prohibit immigration officers from wearing any clothing bearing the word “police,” which some officials complain is deceiving and only serves to escalate tensions in their communities as the Trump administration steps up immigration enforcement. The bill, authored by Rep. Nydia Velazquez (D-New York) and would apply to U.S. Immigration and Customs Enforcement and Border Patrol agents, comes at a time when officials and immigrant rights advocates in Los Angeles are urging ICE agents to stop identifying themselves as “police” in their search for people living in the country illegally. In February, Los Angeles Mayor Eric Garcetti, City Atty. Mike Feuer and Council President Herb Wesson co-signed a letter to the directors of ICE and the Enforcement and Removal Operations division of ICE “to urge in the strongest possible terms that ICE immediately cease this practice in our city.” The letter was copied to Homeland Security Secretary John F. Kelly. The letter noted that the city’s immigrant communities are living in heightened fear of deportation and detention, and that such practices only discourage people from reporting crimes. Police Chief Charlie Beck has also gone to significant lengths to distance the L.A. Police Department’s work from that of the immigration enforcement agency. 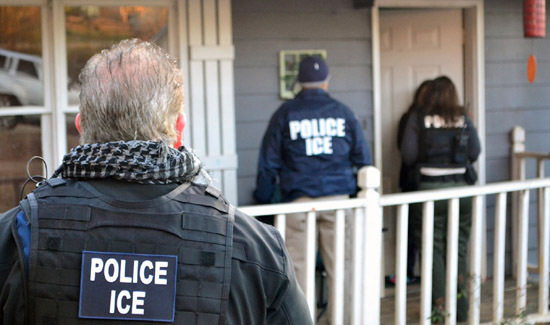 ICE spokeswoman Virginia Kice issued a statement at the time saying ICE agents can, “as a standard practice….initially identify themselves as ‘police’ during an encounter because it is the universally recognized term for law enforcement and our personnel routinely interact with individuals from around the world. “In the often dangerous law enforcement arena” agents identifying themselves as law enforcement could be a “life-or-death issue,” the statement added. There is nothing illegal about ICE agents simply identifying themselves as police officers while standing outside someone’s front door. However, without a warrant, they cannot force their way into someone’s home; instead, they must receive consent from an adult to enter. Feuer said that the city’s letter did not argue that the practice is illegal. “At this point, this is a request grounded on the public safety implications of misrepresentation as police,” Feuer said at the time. “There is no question that in the city of Los Angeles, the word ‘police’ means LAPD,” he said. ICE are police. NY/CA don’t agree with the politics so are attacking underhanded. Local police do have a point where crime does increase when illegal aliens report less crimes due to fear of laws actually being enforced on them. I’m not sure of a good solution there.